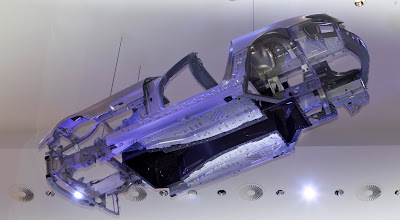 The SLS AMG E-CELL body shell being shown by Mercedes-Benz AMG at the IAA 2011 is one trailblazing outcome of its ambitious "AMG Lightweight Performance" design strategy. Its key element is a transmission tunnel made out of lightweight carbon-fibre composite material (CFRP), which is structurally integrated into the aluminium body shell and firmly bonded with it. The high-strength and stiff CFRP component helps to reduce weight, while also serving as a monocoque housing for the battery modules. The carbon-fibre battery monocoque in the SLS AMG E-CELL forms an integral part of the body shell and acts as the vehicle's "spine". The advantages of carbon composite materials were specifically exploited by the AMG engineers in its design. These include their high strength, which makes it possible to create extremely rigid structures in terms of torsion and bending, excellent crash performance and low weight. CFRP components are up to 50 percent lighter than comparable steel ones, yet retain the same level of stability. Compared with aluminium, the weight saving is still around 30 percent, while the material is considerably thinner. The advantages in terms of weight achieved through the carbon-fibre battery monocoque are reflected in the agility of the SLS AMG E-CELL and, in conjunction with the highly innovative wheel-selective four-wheel drive system, ensure true driving enjoyment. The carbon-fibre battery monocoque is, in addition, conceived as a "zero intrusion cell" in order to meet the very highest expectations in terms of crash safety. It protects the battery modules inside the vehicle from deformation or damage in the event of a crash. Tobias Moers, Member of the Board of Management of Mercedes-AMG GmbH, responsible for overall vehicle development: "AMG Lightweight Performance is the term we use at AMG to encompass all the different technologies involved in lightweight construction. The use of carbon makes vehicles not only lighter, but even more efficient and agile – in motorsports and on the streets. This is especially important for sports cars." Through their experience with the SLR, the vehicles in the AMG Black Series and in motorsport, Mercedes-Benz and AMG have accumulated more than 10 years of expertise in working with carbon-fibre materials. AMG currently makes the propshaft for the SLS AMG, for example, in carbon-fibre. On the SLS Roadster, the supporting structure for the draught-stop is made as standard as a carbon sandwich structure. This component, with extremely short cycle times in an industrially oriented manufacturing process, already demonstrates what will be possible in the future. CFRP components also play an important role in Mercedes-Benz and AMG's lightweight design strategy for the future. In conformity with the motto "the right material, in the right place, the proportion of high-strength steels, aluminium and fibre-reinforced plastics is set to increase significantly in the future. The body shell weight of all Mercedes-Benz vehicles should fall by ten percent compared with their predecessors. Just how seriously Mercedes-Benz and its high-performance arm AMG are treating the issue of lightweight design as an important factor along the road to sustainable mobility, is demonstrated by the full-aluminium body shell of the SLS AMG. With it, the super sports model shows the way for future model ranges.